The prospect of a visit to Seoul this summer, to meet the family of our new daughter-in-law, has prompted me to look into doing some bicycling in one of Asia’s most vibrant, high-tech cities. 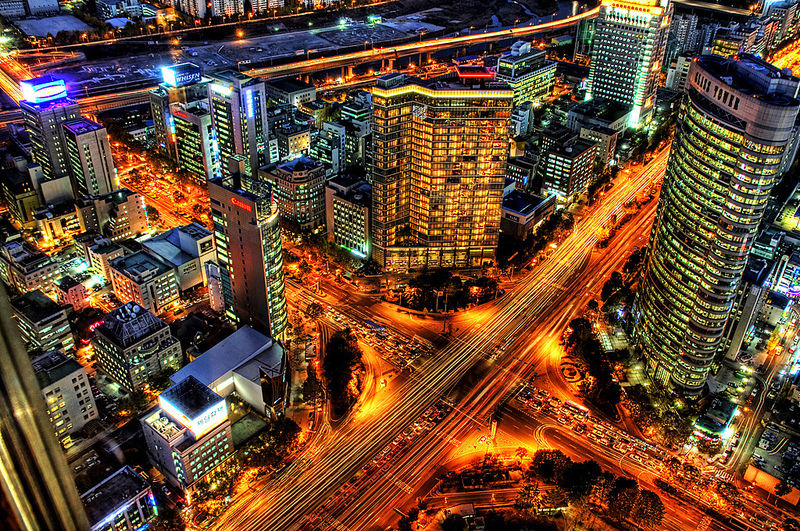 With a population of more than 10 million, Seoul is bigger than New York, and it’s the center of the world’s second-largest metropolitan area with more than 24.5 million inhabitants. Only greater Tokyo is larger. Despite its headlong leap into modernity, embracing everything high-tech from bullet trains to microrobots, this megacity might be more bicycle-friendly than one might think. South Korean officials, including President Lee Myung-bak, have been trying to persuade more Koreans to ride bicycles — a low-tech means of transport — as part of the nation’s green growth strategy, which also includes solar and wind power, hybrid gas-electric cars and buses powered by compressed natural gas. 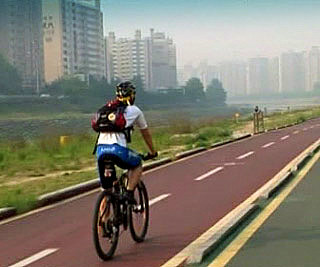 Only about 1.6 percent of Seoul’s commuters use bicycles, partly due to a lack of dedicated paths. That compares with nearly 40 percent using bikes to get to work in Amsterdam, the world’s most bike-friendly city, and about 6.4 percent for Portland, Ore., which boasts the highest percentage of bike commuters in the United States. 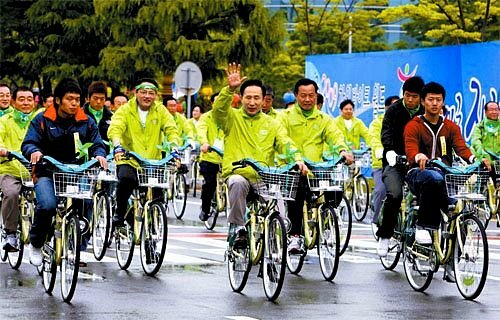 Seoul’s municipal government announced plans on Oct. 22, 2008, to build 207 kilometers (129 miles) of cycle paths over the next four years. The aim is to increase the number of Seoul’s bike commuters to 4.4 percent of the populace in 2012, 7.6 percent in 2016 and 10 percent in 2020. On Sept. 17, 2009, the city announced plans to introduce a bicycle-rental program modeled on the Velib system in Paris, but on a much larger scale. “When we build enough bike road networks in 2011, we can test the system for about six months in downtown and then operate the system citywide,” Mayor Oh was quoted as saying. Because Seoul has a surface area about six times that of Paris, the Koreans plan to integrate the bike paths and rental stations with bus and subway routes to accommodate longer commutes. The idea is to make bicycle paths only a part of a worker’s commuting route. Bikes could be carried on buses and subway cars or rented at bus and subway stations and returned to any rental station in the city. The paths would reach into all corners of the sprawling city. Bike parks, fitted out with shower rooms and lockers, would be placed at 16 subway stations so Seoulites could use both bicycles and public transit to get to work. In some cases, the number of lanes for motor vehicles on major roads would be cut to create new cycle paths. 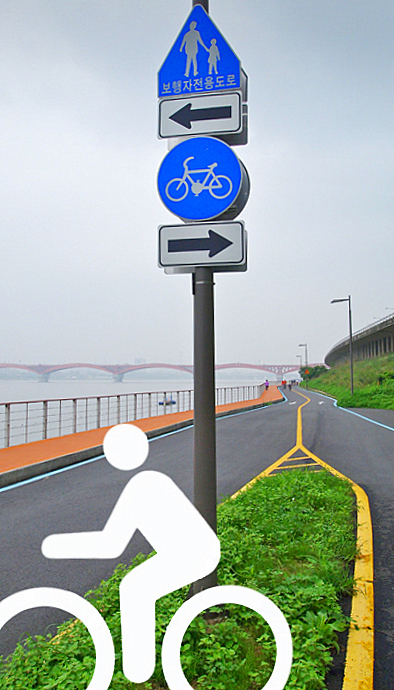 Major segments of the current network of bike paths criss-crossing Seoul are those on either side of the Han River, which flows east to west through the city and empties into the Yellow Sea, the West Sea to Koreans. The bike path on the south side of the river starts upstream around Gwangnaru area on the east side of the metropolis and runs 41.4 kilometers (25.72 miles) to Gangseo Wetland Park near the mouth of the Han River. The bike path on the northern side of the river starts at Gwangjin Bridge on the east and runs 39.3 kilometers (24.4 miles) downstream to Nanji Han River Park. The English-language newspaper The Korean Herald reports that bicycles can be rented at various places along the riverside near subway stops. A ride along the Han River sounds like a pleasant way to spend at least one day during a visit to Seoul. It sure ain’t US 90! That’s for dang sure! I think I’ll stick to the paths along the Han River. Looks dangerous, but quite tame compared to Taipei where one must also contend with thousands of motor-scooters and motorbikes weaving between the cars as well. 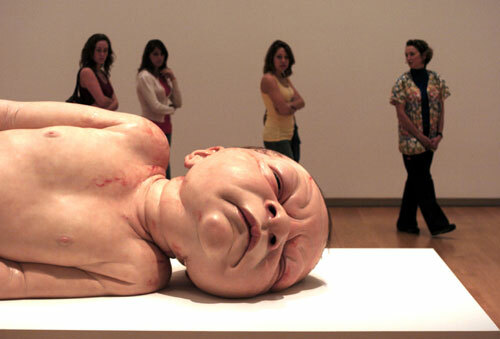 Hectic!